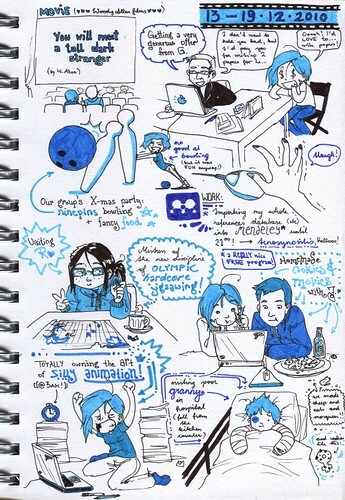 Artist, Scientist, and Mendeley user E*phi drew this cool manga-influenced doodle, which of course caught our eye because it’s got a Mendeley logo embedded right in it! If you publish a paper, but nobody reads it, does it make a difference? Get your work noticed! Adding your publications to your profile helps get your work found. More and more often, people aren’t looking to journal table of contents or library catalogs when they search for research. They’re watching what their friends and colleagues bookmark on social networks or add to groups on Mendeley, and they’re searching Google Scholar. In order to get your work noticed, you need to be present where people are looking. There are a few ways you can do this, but like many things, just showing up counts for more than you would think. Simply having an account and connecting to your colleagues online can position you to get found more often, but also to find more interesting things you wouldn’t have noticed otherwise. With hundreds of papers being published in my field every week, I couldn’t keep up using a pure search strategy. A useful way to keep your contacts up to date on what you’re doing online is to have services tweet out your activity. Now Mendeley will send tweets on your behalf if you add a publication to the “My Publications” folder or comment or like something in a public group newsfeed. You can activate this on your Account Settings page and pick and choose which activities you’d like to have tweeted on your behalf. Another small but useful change is the addition of permalinks to activity feed items, making it easier to call attention to a specific item in the feed. You’ll find those attached to the date for each item. We’ve also made lots of under-the-hood fixes and improvements to the API. Please note that with this release, we’re also officially dropping support for IE6. Let’s play the blame game. Government and universities have failed researchers. I have written before that there are too many PhDs being produced every year. That’s our most viewed post with twice the traffic of the third most viewed post. I think that says something. The result of too many PhDs has meant a surplus of academics doing multiple post-doc tours of duty, lower wages, and a waste of tax payer money. All would be fine if there were enough jobs outside of academia to support those researchers in industry and government, but there are not. Let’s clarify that, there are not enough jobs willing to pay PhDs what they are really worth. And guess what that gets you? Sure, some really smart and passionate lovers of science/research who stick with it, but many of the smart people move on to careers outside of traditional academic jobs where there is money. You lose your talent. Today is not about arguing this claim at greater length though. Today is about alternatives to this problem by asking where are all of the venture capitalists and startup angel investors? We asked our Mendeley Advisors to submit a haiku on their Advisor application and the material that was submitted was so impressive we thought we would open up submissions to the wider Mendeley community. If you’re a poet (whether you know it or not), send us a tweet including #mendeleyhaiku or post on our Facebook page and we’ll add it to our collection. To make it a little more fun, we’ll pick a winner and feature their haiku on this blog, twitter, and our Facebook page. We’ll also give the best scholarly poet to enter our competition the item of their choice from our Cafepress page, and a premium account for ten of their friends who aren’t using Mendeley yet. Scoring will be based on the number of retweets or likes of the post. Haiku should follow the traditional form and must include the #mendeleyhaiku hashtag or be posted to our Facebook page to enter. DEADLINE is February 14th, so get your creative juices flowing! New Web Release: Embedded groups, web download links & raised API limits.